Botanically identical to tender-skinned summer squashes, winter squashes are my unsung hero of autumn-winter eating. Not only do they keep well – you can forget about them for over a month and they will still love you – they are just about the most useful and delicious of the cold weather crops. 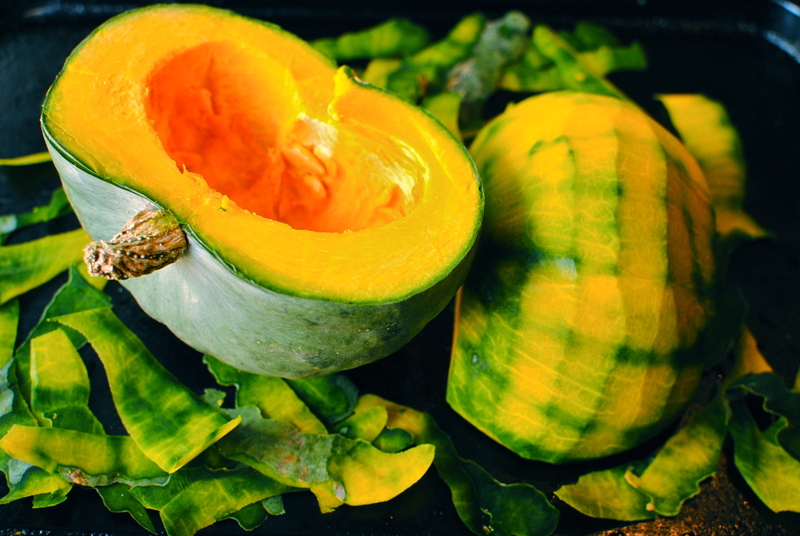 Butternut squash, acorn, Delicata, kabocha, Hubbard, sugar pie, red kuri, spaghetti, Hokkaido – and loads more – their tough unyielding armour holds rich, sweet, nutritious flesh. Winter squashes are lovely just diced and sauteed with your favourite over-wintering herbs such as thyme, sage or rosemary. Their texture also makes terrific naturally creamy-tasting soups and comforting slow-baked gratins. 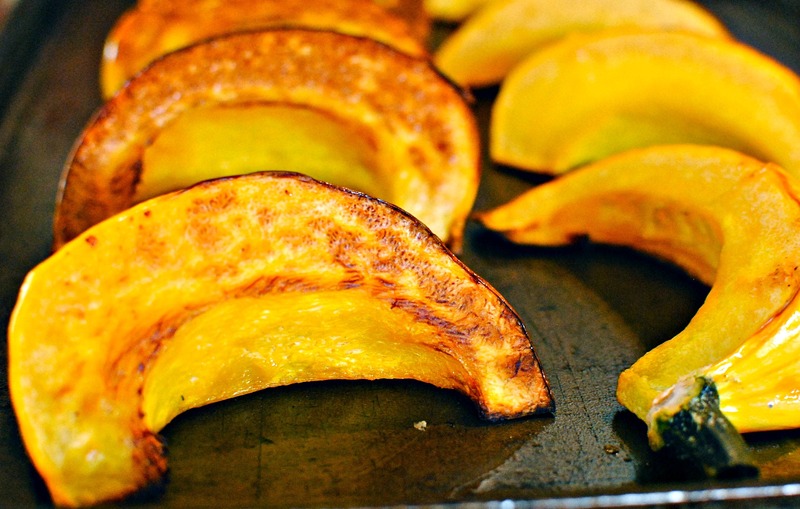 One of our favourite, no-brainer ways with any squash is just plainly roasted, with maybe some garlic on the tray, and added to a risotto. I will post my three-grain pumpkin and chard risotto soon. I have found that winter squashes partner well with most any protein – with perhaps the exception of white fish – and are a great foil for bitter greens, tangy cheeses, earthy root vegetables and cooked beans. In other words, a vegetarian’s dream. Although most squashes are harvested in the autumn they are available from now until early spring, giving much needed colour to winter meals. During this time of year I am never knowingly without some kind of winter squash waiting patiently in a cool cupboard (or the garage!). They are such a winter staple food here at food to glow that as soon as I use one I feel compelled to stock up on more. I feel similarly about kale, olive oil and lemons. Yeah, I’m a bit weird. What autumn-winter food can you not do without? Miss R’s track of the week: “I Sat By The Ocean” by Queens of the Stone Age – because that’s what we will be doing for 2 weeks! 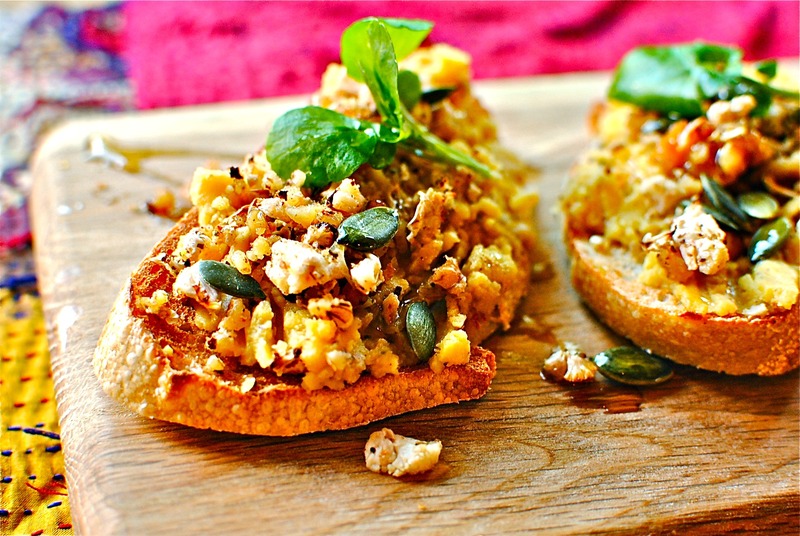 Roasted Pumpkin Hummus and the Cauliflower and Walnut Crumble topping is not only easily put together but independently useful. In addition to the ‘normal’ uses I have tried the hummus on its own as a rich, silky stir-through sauce for pasta (with a dousing of olive oil), stuffed into cherry tomatoes (delish but fiddly with my poor fine-motor skills) and thinned down with stock and slurped as soup. 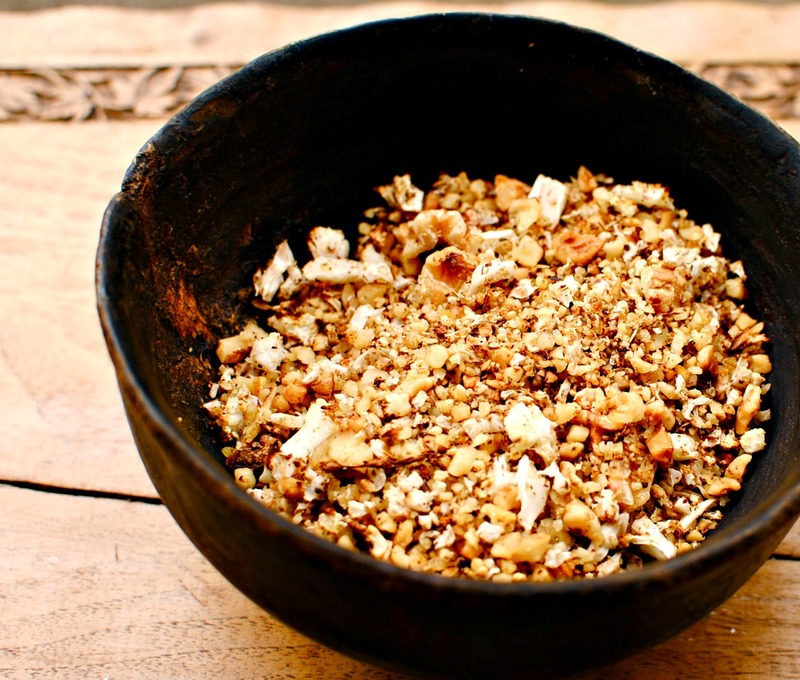 And the crumble topping can grace gratins (probably it’s natural home), be used to anoint fish and chicken for grilling, and just as a topping for pasta and hot or cold salads – vegetable or grain. You will think of other uses, I’m sure. This hummus sounds unusual but if you get a flavourful pumpkin you may just fall in love. We have. Za’atar: 2 tbsp dried thyme, 2 tbsp toasted sesame seeds, 1 tbsp ground sumac (Bart’s and Steenberg’s in the UK), 1 tbsp each dried oregano and marjoram, 1 tsp sea salt (I use smoked). Whiz these briefly in a spice mill/coffee grinder and store in a tightly lidded small jar. I use this stuff all the time. 1. First of all, the pumpkin. If it is awkwardly ridged, and not at all conducive to peeling without cursing, slice into wedges and rub all over with the oil. If you want to peel it, go ahead, chopping the flesh and rubbing with oil. 2. Take three of the garlic cloves, smash lightly and rub these with oil too. Lay all on a tray and roast for about 30 minutes, turning the pumpkin and garlic half way through cooking. When cool enough to handle, peel the garlic and – using a spoon – scoop the pumpkin from its frazzled skin. Pop the pumpkin flesh and peeled, roasted garlic in a food processor. 3. Using a pestle and mortar smash the two remaining garlic cloves (peel first) with the salt, then add in the lemon. Make a cohesive paste and add to the food processor bowl, along with the cumin, tahini and za’atar. You can skip this step but these are harder for food processors to mix well compared to the soft, yielding pumpkin. Doing this tiny step keeps from having to blitz the whole thing to the consistency of baby food. 4. While the pumpkin and garlic are doing thing in the oven, toss together the crumbed walnuts, cauliflower, za’atar and salt. Lay this thinly on another baking tray and bake in the oven for the last half of the pumpkin cooking time, turning halfway with a spatula. You can mix through a little oil but I don’t think it is necessary as the oil in the walnuts seems to do a good enough job. 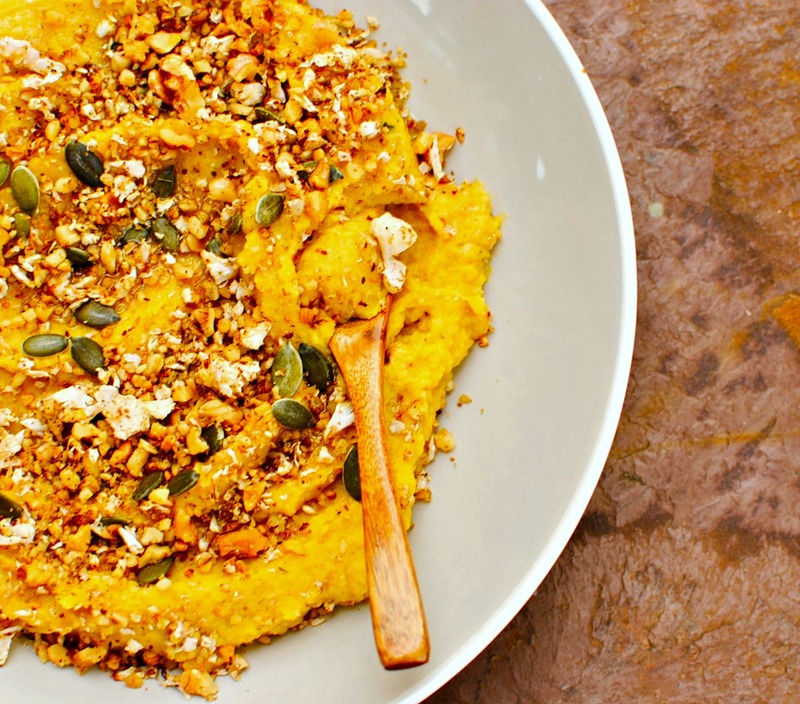 To serve, spread the pumpkin hummus in a serving bowl and either let everyone help themselves to hummus and crumble as they wish, or sprinkle over a generous amount of crumble with extra on the side. Goes wherever chickpea humus goes – with flatbreads, with cut vegetables, with other meze dishes. There will be leftover crumble. This can be revived in a hot pan (with maybe a touch of oil) and used on any remaining hummus. We had leftovers with grilled lettuce, fried capers, chopped salad things and thinly sliced and toasted sourdough bread. It is great in hot pasta too. 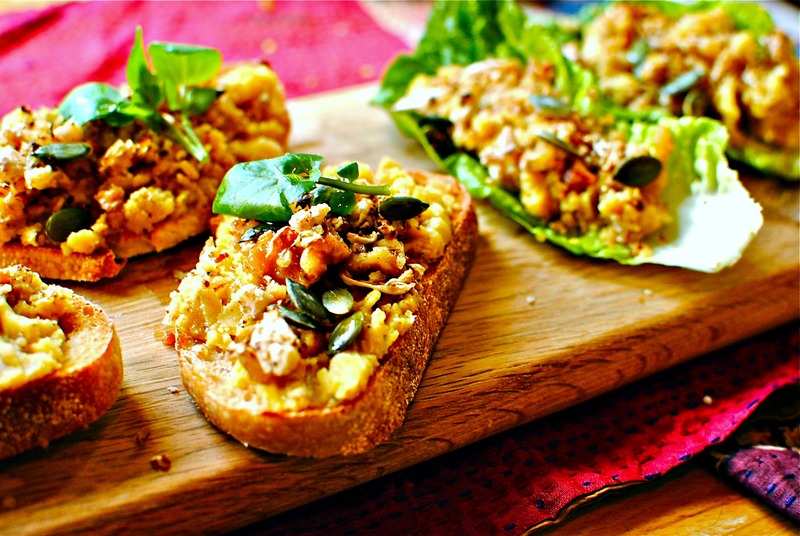 Serves up to 6 as an appetizer, or with a light lunch/mezze. Refrigerate leftovers separately and eat within five days. Oh Kellie! You truly are a master! Thank you! Sharing now! What a great idea!! We get pumpkins here all year round so I am still cooking with them even though it’s spring. Have a lovely holiday! A compelling fall recipe with a change from the usual hummus! And the lovely orange color is marvelous! Have a grand vacation! Have a wonderful holiday! As the summer is clearly over, I’m now looking longingly at autumnal recipes, dreaming of crisp mornings, scuffing fallen leaves and collecting shiny conkers! I look forward to trying this at the weekend. I adore cauliflower and am always keen to find new ways of cooking it. I love roasting it with a little oil, turmeric, a sprinkling of salt and some cashews chucked in at the last minute to toast. Great instead of rice with a curry. Bon yoyage! I love this! When I was in Thailand a couple of years ago I did a vegetarian cooking course, and one of the things we made was pumpkin ‘hummus’. It wasn’t hummusy at all, but was steamed pumpkin blended with some soy protein and some thai spices. Really good! this is reminiscent of that, but in a slightly different direction. Enjoy your holiday! This is really creative, Kelly! It would be a great starter for a dinner party, and I love that you use za’atar in so many of your dishes. 🙂 I am a soup/stew/curry kind of girl in the cool months, and I love adding sweet potato in any of the above. Though we can kind of get it all year around, I think it’s especially special in the fall/winter. Also can’t do without apple cider right now! Enjoy your holiday! This looks absolutely perfect! I love the idea of putting on a crunchy topping, hummus dishes are so often blandly smooth with no textural differences. Amazing photos too, btw! And I always wondered just exactly what za’atar was, so thanks! Why have I never thought to make this?!!! Brilliant! This sounds delicious. Cannot wait to try it. Thanks for the recipe. Very creative!! It looks very delicious!!!! Thanks for linking up and giving us this super recipe, I appreciate you! 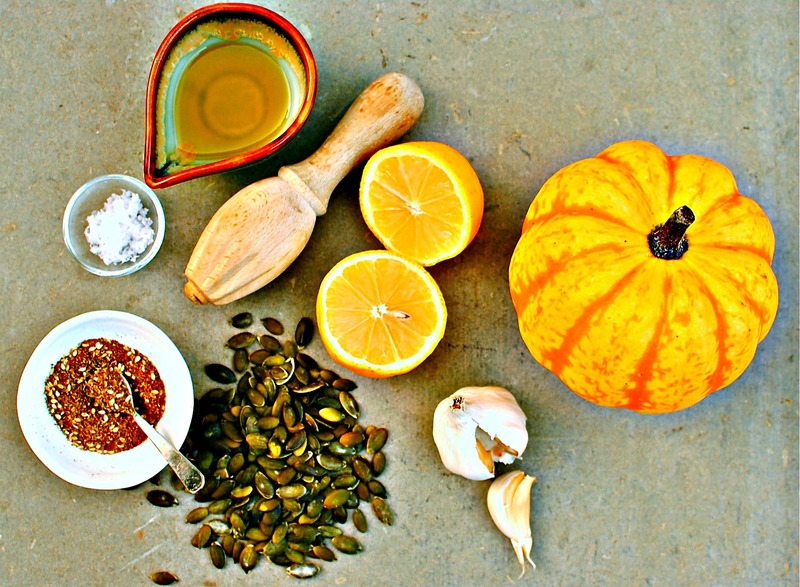 I love squash and this hummus / next day soup sounds a wonderful ocmbination of flavours! thanks for linking this to one ingredient. Soups and one pot slow cook meals are my staples for winter. with chilli and spices added liberally. Hope you are having a great holiday . I love this take on hummus, the squash are so good this time of year! What a great idea. I’m not that keen on squash so maybe this would convert me! Throughout autumn and winter I don’t think I could live without mushrooms. 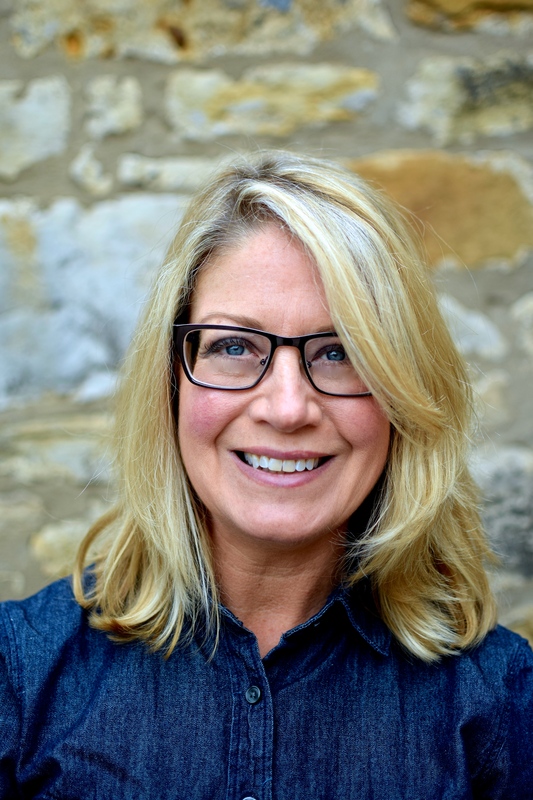 I just stumbled upon your blog & boy, does this recipe make me happy. Traditionally, I see pumpkin ruined by fattening lattes & other unhealthy desserts. I am glad to see it being used in a healthy and filling way! Keep up the good work. Wow…this looks and sounds delicious, I’ll definitely be trying this!